C6: business office, Métallurgie Physique et Génie des Matériaux, Mineral Physics, Plasticity, and the rest of Ingénierie des Systèmes Polymères group. All are a couple of steps away (red itinerary on the map) from the Cité Scientifique metro station. By car, arrive on the campus at the "4 Cantons" metro station and follow the blue itinerary on the map. To come to the campus from Lille or any of the train stations, we recommend the metro to the Cité Scientifique station using line 1 (yellow line) heading towards 4 cantons. For more information, have a look at the map. For time tables, and prices: Transpole. From downtown Lille, it will take about 15 minutes to the campus. Most trains from Paris arrive at Gare Lille-Flandres (1 hour by high speed train - TGV). Trains from other french regions and from the Charles de Gaulle airport arrive at Gare Lille-Europe. Eurostars (from London and Brussels) also arrive at Lille-Europe. Both railway stations are in the center of Lille and are only a few hundreds of meters from each other. The easiest way for reaching the Campus Cité Scientifique at Villeneuve d'Ascq is the underground from Lille-Flandres (line n. 1, yellow line) to station Cité Scientifique. From Lille-Europe take line n.2 (red line) towards St Phillibert and change line at the Lille-Flandres station (1 stop). You can also walk to Lille Flandres from Lille Europe. From then East (Dunkerque-Calais), follow indications for Paris, then Villeneuve d'Ascq, and exit at ... Cité Scientifique. The closest airport is Lille-Lesquin Airport (LIL), with flights from some major french cities and some (rare) international cities. 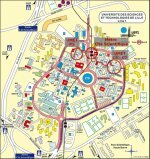 To reach the Campus, we recommend a taxi (5 km). The Charles de Gaulle airport of Paris (CDG) is 50 minutes away from Lille by TGV (high speed train). On request Air France and other airlines can even sell tickets which include the CDG-Lille Europe segment in correspondance with the flight (Formule TGV Air). The Lille Europe train station airport code is XDB. Brussels airport (BRU) is approximately 2 hours away from Lille by train. By car, plan for 1h 30mn to 2h 30mn, depending on traffic in Brussels. Take the train from the airport to the central railway station of Brussels (Gare du Midi) then the high speed train to Lille-Europe (Eurostar, Thalys ou TGV) (38 minutes). By car follow the indications to Mons-Paris, then Tournai then Lille (Rijsel in Flemish). Brussels-South-Charleroi (CRL) airport is approximately 1h30 from the Campus by car. Take the directions of Mons, then Tournai, then Lille. CRL airport is mainly used by low cost airlines. There are also train and bus connections between Charleroi and Lille.